Recycling Christmas decorations can be a little more complicated than putting them into curbside bins. 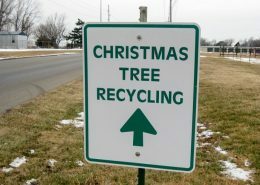 The Colorado Association for Recycling says most communities in the state offer free programs to take trees, lights and wrapping paper. Places farther away from metropolitan areas usually have fewer options though, said association president Juri Freeman. So that leaves you with the traditional trash bin, or maybe a nice road trip to the city if you want to stay eco-friendly. For those in more populated parts of the state, here are a few proper post-holiday recycling tips. This is the most popular form of decoration recycling in the state. Recycled trees are usually broken down into mulch and re-sold. But first, residents should make sure the tree is completely bare of any ornaments or lights. It’s up to each community to decide what programs to offer. Denver: The city offers a free “Treecycle” program where waste management drivers will pick up bare trees from homes. All residents have to do is strip their trees of all decoration and put them on the curb with the rest of their trash before Jan. 12. Colorado Springs: Six drop off locations will be available Dec. 30, 31 and then Jan. 6, 7. Dropping off a tree is free but the city does recommend a five dollar donation to support the organizer, El Pomar Youth Sports. Boulder, Longmont, Lafayette, Erie, Louisville and Superior: The nonprofit Ecocycletakes care of all the foothills communities. A drop off location is available in each city for free. Fort Collins: Larimer County Landfill offers free tree recycling until Jan. 15. The city of Fort Collins has also set up five drop off locations. Lights need to be taken apart before they’re recycled. If the pieces of plastic and metal aren’t separated from the strand they can cause complications at recycling facilities. Boulder, Nederland and Longmont: Ecocycle also handles drop off locations for hard-to-recycle items like Christmas lights. The nonprofit will send the lights to a processor who will strip the plastic off and recycle the copper wire. Denver: From Nov. 15 to Jan. 20 Denver residents can bring burnt out, discarded lights to the Cherry Creek drop off location. But the city does not accept liquid-filled or neon lights. Loveland: Every year the city partners with ACE Hardware and the Lights for Life program. The hardware stores sell the salvaged copper wire from recycled lights and then donate the proceeds to cancer nonprofits. Freeman said wrapping paper tends to be the most overlooked when it comes to proper recycling. That’s because a lot of wrapping paper can be recycled easily and placed in curbside bins. But paper with metal or foil components needs special handling. Most drop off locations that accept lights will also accept metalized wrapping paper, he said. But Freeman said there might be an even better solution.